This vegetable although fruit is a favorite mix for vegetable salads. It is produced in mass by people from the Southern barangays of Sagada. This food is low in Saturated Fat, and very low in Cholesterol and Sodium. It is also a good source of Vitamin A, Pantothenic Acid, Magnesium, Phosphorus and Manganese, and a very good source of Vitamin C, Vitamin K and Potassium. The cucumber is believed native to India, and evidence indicates that it has been cultivated in western Asia for 3,000 years. From India it spread to Greece and Italy, where the Romans were especially fond of the crop, and later into China. It was probably introduced into other parts of Europe by the Romans, and records of cucumber cultivation appear in France in the 9th century, England in the 14th century, and in North America by the mid-16th century. Cucumbers are a good source of Vitamin C, Vitamin A. It also contains calcium and potassium. Also the green color indicates it is a great source of chlorophyll which is a valuable phytonutrient. Pickles are made from cucumbers. According to the pickle industry over 5 million pounds of pickles are consumed daily. 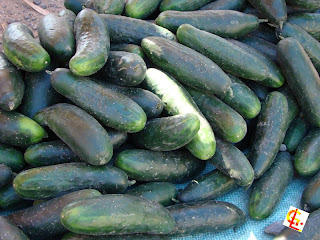 Store cucumbers in plastic to protect them and maintain their natural moisture. Store in a refrigerator crisper or in a cool environment.